This Daily Mail article singling out Russia as a large-scale great ape import-export centre comes as no surprise to PEGAS. We had already begun an analysis of CITES great ape trade data, which shows an unusually high proportion of great ape trades involving Russia, often with countries formerly part of the USSR. Investigations by the Hetq newspaper in Armenia also identified a wildlife trafficking kingpin based there that exported large numbers of great apes and monkeys to Russia. One must ask the question after reading the Daily Mail article: What is the Russia CITES Management Authority doing? One must also ask: What will CITES do about this obvious abuse of the Articles and Resolutions in its international Convention? 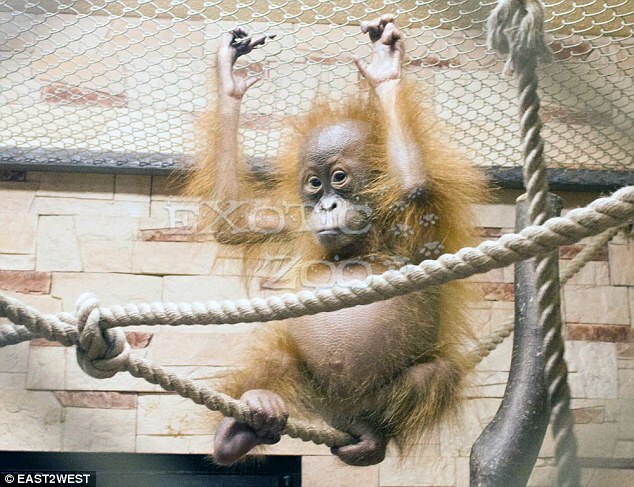 Baby orangutans are being bred in Russia as exotic pets to sell as playthings for the super-rich and are being advertised for sale on the internet for £24,000, a MailOnline investigation has found. And the endangered creatures are not just being reared in Russia but also being imported in an apparent defiance of international rules. With very little regulation and a myriad of legal loopholes, a booming animal trade has grown with a shocking selection of animals – from macaques to falcons – being offered up for sale over the internet. At a “nursery” called Exotic Zoo in Desna village outside Moscow, MailOnline was offered an orangutan for two million roubles (£23,845). The great apes are in the Red Book, an internationally recognized list of endangered species. Dealers claim that they have “all the documentation” and boast that they make ideal pets because they mimic their owners, “won’t bite” and can be dressed in clothes and nappies. 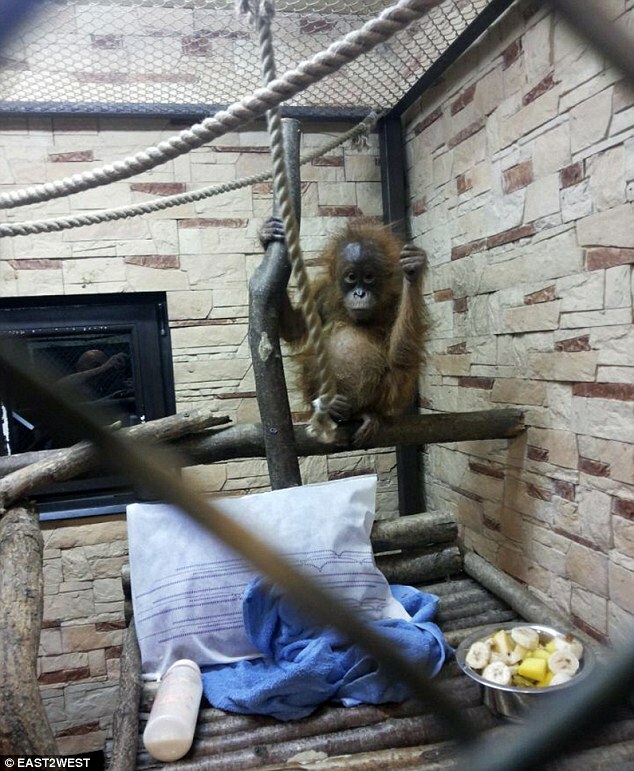 The male orangutan we were offered was around one year old and and appeared to be in good condition. The seller, who did not give his name but was in his 40s, told our reporter, who was posing as the representative of a rich potential buyer: “Here you are, please hold it. Don’t be afraid, they are like babies. “He won’t bite, he’s curious about you. Let him hold your clothes with his hands and legs. He is about one year old, this is a perfect age to find a new home for him. One dealer here told potential customers that all the animals “were born in the nursery under supervision of experienced professionals” and that they are regularly checked by vets. Our reporter, Tanya, was allowed to hold the orangutan for around 15 minutes. The curious animal looked intently into her face. “Please tell your boss to make up his mind quickly, many are interested in orangutans and they are not born very often,” said the dealer, evidently expecting a rush of business ahead of New Year, when Russians traditionally exchange seasonal gifts. Another dealer at Exotic Zoo told Tanya: “I expect you have been calling other advertisements too. “Please be careful with other offers, there are many people who bring these animals illegally from abroad. “I’m sure your boss does not want problems with his new pet. He claimed their work was entirely above board. “Our animals are born in Russia because we are a nursery, this is why all their documents are in order,” he said. “When you buy an animal from us, you get its international passport and all the necessary veterinary documents. “Having all these, you can easily travel with your animal wherever you want – around Russia or even abroad if you need it. “Our monkeys have electronic chips in their bodies with international numbers, they can be easily identified if necessary. “This is why our monkeys and other animals are quite expensive but if your client is serious, he would understand the difference. “We have been in this business for many years. We have co-operated not only with private clients but also with zoos. “We will give you all necessary recommendations how to take care of the animal. The nursery took strict measures to stop any photography at its site, though MailOnline obtained pictures inside this breeding centre for rare tropical animals which is based in two converted family houses. Unless she made a down payment of thousands of pounds undertaking to buy the baby orangutan, Tanya was told she was not permitted to photograph the creature or the facilities. Tanya was told the breeders were scared of interest from journalists in their facility which is located behind a barrier in two modern villas in a gated and secure residential compound within easy reach of Moscow. Exotic Zoo – and many facilities like it – claim to be running an entirely legal operation. Russia is a signatory of the Convention on International Trade in Endangered Species (CITES) which prohibits their unlicensed international trade, notably for ownership by private individuals. CITES told MailOnline that Exotic Zoo was not registered with them, which means the nursery may not be licensed to supply the correct documentation for the animals to be taken abroad. However, there is no suggestion Exotic Zoo is trading internationally. Russia’s own laws, however, do not impose curbs on nurseries which conduct their own breeding programs of these rare animals, nor on sales of the resulting animals to wealthy people wanting exotic pets. Even where there are penalties relating to the movement and ownership of endangered animals, the fines are too small to act as a deterrent. In Britain, the keeping and breeding of orangutans requires a strict license under the Dangerous Wild Animals Act which experts say would not be granted unless at an approved zoo as part of an international breeding program and certainly not for use as pets or domestic trade. Because they are an endangered species, all breeding is controlled by the EEP (an endangered species program). Zoos and others who do not follow this can be prosecuted. Some primates, however, are allowed as pets in the UK, but conservationists are pushing for a complete ban as seen in other EU countries including the Netherlands and Hungary. Claire Bass, executive director of Humane Society International UK, said: “Keeping any primate as a pet unquestionably compromises their welfare, threatens species conservation and puts human health and safety at risk. “Monkeys and apes have very complex needs that cannot possibly be met in people’s homes as pets. In November, the International Fund for Animal Welfare sounded an alarm over the rampant sale of exotic animals over the web. The report highlighted Russia and China as the worst offenders. Anna Filippova, a campaigner for IFAW Russia, told MailOnline: “There is a colossal, large-scale problem. So any publicity that throws a spotlight on the distasteful practice is unwelcome and may prompt a crackdown. Another dealer active on the web – called Viktor Sergeevich, evidently with a different supply chain – also offered orangutans to MailOnline, quoting a price of $40,000 (£25,700). “I have two young orangutans for sale, both about one year old. They were not brought from anywhere, they were born in a special nursery in Russia,” he told us by telephone. 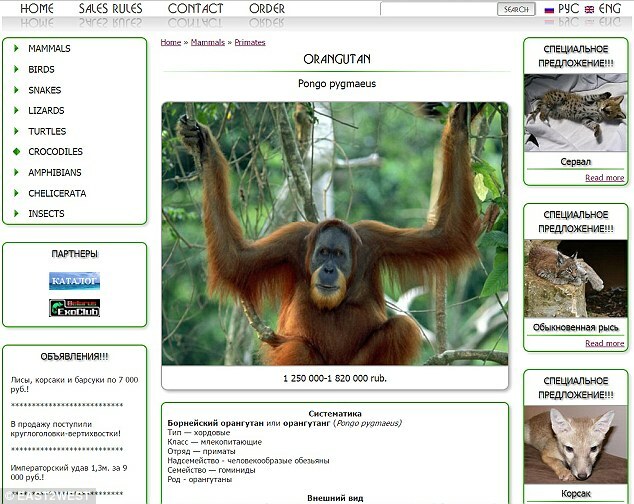 A third trader in rare animals – called Viktor Saveliyev, based in Volgograd – said his orangutans were imported rather than bred in Russia. His outfit, called Zoo Ekzo, amounts to an online mail-order service. Customers specify their desires for exotic pets, and his company seek to supply them accordingly. “I do not have males, only female, several, all about eight months old,” he claimed when asked about his current stock of orangutans. He promised the animals would have “all the necessary documents with them”. But he said providing “official” documentation would lead to an extra 7.5 per cent in the price. Ever the salesman, Saveliyev challenged claims from other breeders that orangutans could be raised effectively in captivity. He claimed his source was unspecified “European zoos”, and that the orangutans were legally imported – even though animal rights experts dispute that there can be legitimate imports for private clients. Saveliyev said he had “ties” with breeders in Russia, other ex-Soviet states as well as foreign countries – “and also zoos, circuses and catchers”. Having made an order for an exotic animal, customers collecting it from his company pay 50 per cent in advance. Those who expect delivery, shell out 100 per cent at the point of order. Phone numbers posted by advertisers are regularly changed. During the course of this investigation we also discovered sales of rare monkeys, falcons, leopards, crocodiles and snakes. Ms Filippova said: “Most often the exotic animals are bought to be used for commercial purposes – for example, for taking photos, which is legal. She explained there are a number of “nurseries” or “foster care centres” around thirty to two hundred miles from Moscow. She said that many animals arrive in Europe through illegal or legal means and are then transported via Turkey and Ukraine to Russia. “There are all sorts of ways that animals are smuggled in. There was a case in the Far East (of Russia) when baby turtles were attached to the bottom of a car with sticky tape,” she said. “Only 20 per cent of the animals survive the journey but that’s enough to pay off for the expenses in this trade. She added that if an animal is taken out of the wild and put in a zoo legally because of injury or the destruction of its habitat, there is nothing in place to regulate its offspring being sold on. Legislation is a “huge black hole”, she said, adding that there is no specific laws which govern the breeding centres or the conditions that the animals should be kept in. Ms Filippova added that owners can “show any sort of printed paper to prove that an animal has legal origins”. Natalia Dronova, WWF-Russia species coordinator, said: “Legal and illegal animals mix up. “Nurseries develop their own sorts of documents, vet passports and other sets of documents”. This entry was posted in CITES, Russia and Eastern Europe and tagged CITES, Russia and Eastern Europe. Bookmark the permalink.